A few weeks ago, you might have picked up on my annoyance at having to debunk rumors regarding food stamp policy changes and sensationalized articles about food assistance cuts. From now on, I will regularly write here about new policy changes and upcoming cuts that will affect those on assistance. I’ll try to make it as simplified as possible while giving a complete rundown of the correct information. FIRST… let’s talk about cuts to SNAP but let me start with touching on the passage of The Farm Bill last year. The SNAP program budget is part of the Farm Bill. The Farm Bill is typically renewed every five years. In 2014, it took awhile to renew , in part because of disagreement over the SNAP budget. Republicans wanted drastic cuts. In the end, $8.6 billion was cut. Those cuts span the next decade, not all at once. With passage of the 2014 Farm Bill, the SNAP budget is in place until the next time Farm Bill is renewed. This means Congress will not be making MORE cuts to SNAP until that time. I say all of this because on my own social media, I am constantly seeing people talking about Congress trying to make more cuts to food stamps. The other day,for example, an article from February of 2014 talking about Republicans proposing $39 billion more cuts to SNAP made the rounds. My request to all Liberals who use social media (especially managing Facebook pages) to please,please,please check the dates on articles, as well as fact check the information. You might not understand this but it causes a lot of panic among people who rely on assistance. Don’t make people worry more than they have to. Also don’t use the topic of food insecurity as the only means you have to demonize Republicans. I’m sure there are plenty of other current events that will illustrate this as effectively. The good news about the major cuts in 2014 is that only 15 states will likely be affected , thanks to the “heat and eat” loophole. In 2016, some states will revert to the 1996 Welfare Reform Act that puts limits on how long an unemployed person without dependent children can receive food stamps, usually only three months. Some states already have this policy in place. The other part of this is that some states that qualified for waivers because unemployment rates were high in some areas without enough jobs to match the employment needs are now seeing an upswing in the economy and will lose those waivers, meaning less people will qualify for enrollment. Even though other states who have tried instating a drug testing policy for all recipients of assistance have proven it to be a giant waste of money and time (as well as unconstitutional), Michigan has launched a pilot program in 3 counties that will test people “under suspicion”. Michigan actually tried this legislation before in 1999 and it was ruled unconstitutional. I am anti-drug testing all the way around but this legislation has me particularly peeved. Suspicion based? What qualifies someone as being suspect? I can’t help but predict racial stigmas will come into play heavily here. 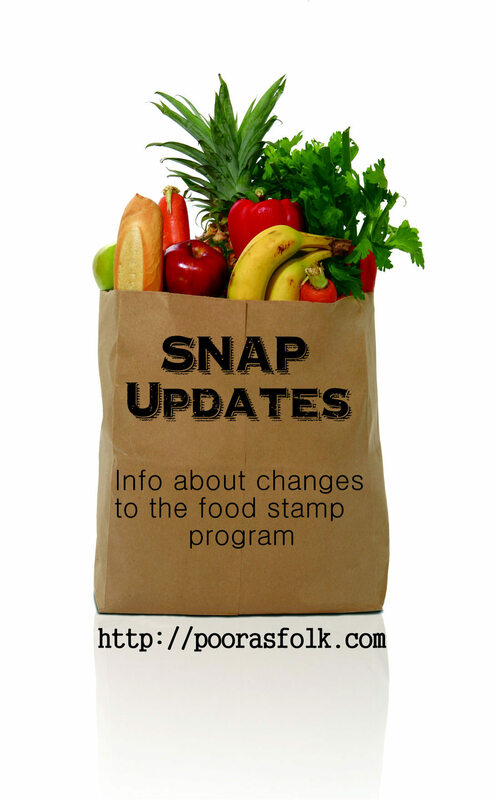 Right now, this policy is NOT for SNAP recipients as has been widely stated. Only recipients of TANF (cash benefits) in The Family Independence Program will be subjected to testing. HI. can I post a fridge of SNAPP receipient? I received a meme of a stocked fridge… on SNAP? Mine is so sad compared. I haven’t had time to moderate all comments here recently. I usually scroll through and answer ones that are a clear question from someone needing info 1st and get to others when I can. What was your other comment regarding? There are no merits to drug testing. So what you are saying, is that you refused to post another persons views on the situation, because they don’t agree with your position on the matter? Whether or not you agree, it would have been an excellent chance for you to further your point by countering mine. By deleting my post, you are just lowering yourself to the level of the people that you don’t agree with. “IT’S MY WAY OR THE HIGHWAY!” mentality is what causes these social problems in the first place. Although, I am assuming that you do your fair share of drugs, hence your terse response. Dan…I don’t even know what your original comment said. I don’t see it anywhere.